Those who have used the Nikon D5100 will immediately be at home with the D5200. The cameras are almost identical in size and weight. At 555g including battery and card, it is possible to carry the D5200 around all day without feeling the strain. The shell of the body is made from a tough polycarbonate and the camera fits in the hand rather well. Add a big lens, however, and the set-up feels a little front heavy, and one begins to desire a deeper handgrip to get a firmer hold. However, the sort of photographer this camera is aimed at is likely to be buying lightweight lenses. The articulated screen is hinged on the side of the camera and is undeniably useful for viewing and composing images from various angles. In use, the D5200 is more suited to those who set the camera in one mode and shoot away, which is unsurprising given its target audience. For example, the camera does not have dedicated buttons for some key exposure controls, such as white balance and ISO. Instead, these are accessed through the info menu or through the function button, which can be user-defined to adjust a single control. One source of frustration is in using the self-timer drive mode, because the camera returns to the previous selected drive mode after each capture. So, when shooting landscapes using mirror lock-up and self-timer, one has to reactivate the timer for each shot. Each button is a little ‘clicky’, which is a common distinction between an entry-level camera like the D5200 and a weather-sealed enthusiast model like the D7000, where buttons are satisfyingly dampened. The buttons are small, but spaced apart enough to prevent pressing the wrong one. There is the same pop-up flash as that found in the D5100 and D7000, with a guide number of 12m @ ISO 100. When using external flash units, there is a maximum flash sync speed of 1/200sec. Nikon has introduced a new graphic interface. It looks a little slicker and more modern than the one in the D5100, but is still beginner-friendly. For example, in the main exposure-settings screen, visual displays are used to indicate changes to settings such as aperture. Such aids are a useful way to visualise what the camera is doing and what sort of results to expect, so is ideal for those learning the basics. Another similarity to the D5100 is the switch on the shooting-mode dial to access live view. For shooting landscapes, live view is preferable because the mirror is locked up and magnification is very useful to ensure a subject is in focus. 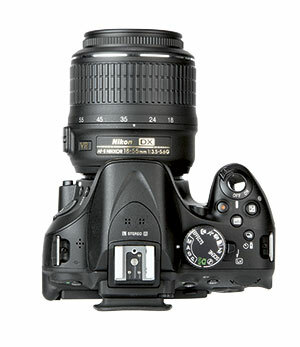 Nikon DSLRs do not allow mirror lock-up and timer mode simultaneously, except in live view. The camera has a quiet mode in its drive-mode menu. I find the shutter is impressively quiet already, and there is little difference between the single mode and quiet mode. The same EN-EL14 battery is used in the D5200 as in the D5100 and D3200. It is physically tiny for a DSLR but still provides a 540-shot battery life, which is respectable although not as good as some other DSLRs at this level.